At McKenzie River Dental, our staff understand that even the healthiest of smiles occasionally require some repair. If you’ve have a missing tooth or require a dental bridge or dentures, then dental implants may be the right solution for your cosmetic dental needs. Dental implants are made from titanium and are surgically placed into the jawbone underneath your gum tissue to replace the roots of a missing tooth. Once a dental implant is in position, Dr. Schilt, cosmetic dentist in Springfield, can use the implant to anchor replacement teeth and restore your smile back to health. Restoring a lost tooth so that its replacement looks, feels, fits, and functions naturally. Other common cosmetic treatment options, such as dentures and bridges, can lead to bone deterioration, and may interfere with common daily activities like speaking, smiling and eating. Providing a lasting, cost-effective solution. Dental implants can last for a lifetime when supported with proper oral hygiene and dental visits to our cosmetic dentistry in Springfield, Oregon. Enjoying your smile without worry. Having confidence in your smile means never having to worry about the embarrassment that can come from a gap in your smile. Dental implants can help improve your self-confidence and self-esteem by restoring your smile back to health. Protecting your bone health. Dental implants rank as the only dental restoration that helps to preserve and stimulate natural bone, actually working to cause bone growth and prevent future bone loss. Have developed trouble eating due to a missing molar or incisor. Want to avoid neighboring teeth shifting or moving to fill the gap made by a missing tooth. Want to avoid the loss of the bone structure that surrounds a missing tooth. 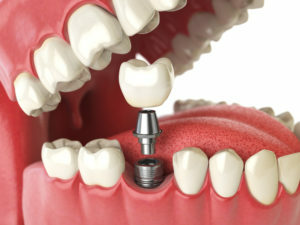 To receive dental implants, you need to have healthy gums and adequate remaining bone structure to support your implant. For your dental implant to continue to provide the stability and support needed to improve your smile, it’s vital that you practice quality oral hygiene daily to keep your implant healthy. This means brushing at least twice a day, flossing daily, and scheduling regular exams and cleanings at our cosmetic dentistry in Springfield, Oregon are all vital to ensuring the long-term success of a dental implant. To find out more about what dental implants can do to help improve the state of your smile, contact our cosmetic dentistry in Springfield, Oregon to schedule a consultation with Dr. Schilt today!